Two or three years ago Jeff ‘Lehm’ Adams began modeling the Guild Hall from the Myst Online: Uru Live game’s concept art. 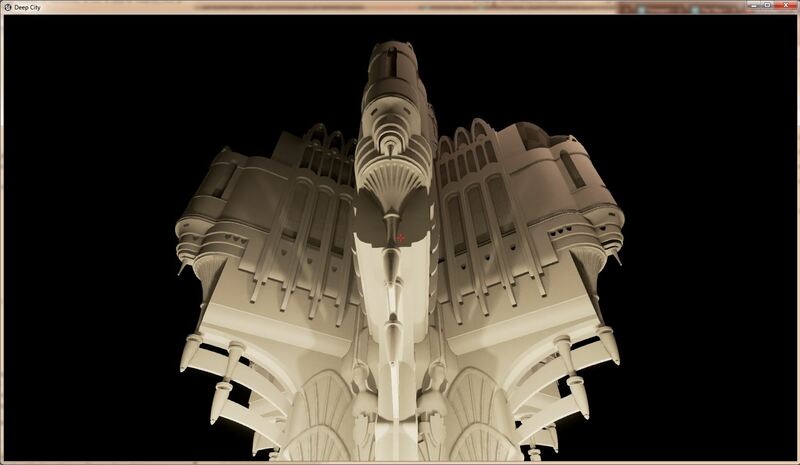 I later started modeling it for my use in OpenSim. I had started building a replica of the guild hall in OpenSim before the introduction of mesh. So, it was being built with prims, which was rather limiting. Once mesh was on the horizon I lost interest in the prim build. Jeff had RL distractions. Neither of us was doing much with the Guild Hall. Now he apparently has had some time and has moved his work into the Unreal Engine and made a standalone model available in an executable Unreal file. Jeff ‘Lehm’ Adams ‘ Myst Guild Hall. You can find a copy of the Guild Hall linked to from the Myst Uru forum. I haven’t worked on my model of the Guild for some time, years. Walking around in his model and walking in my model is very different. Seeing his nearing completion rekindles my interest. I need to get Blender’s procedural textures figured out and generate some textures. Posted in Myst-Uru. Tagged Guild Hall. Movement on the mesh project appears slow right now. The effort is going toward combining the mesh code and regular simulator and viewer code and the effort to get it all to compile using VS2010. So, we aren’t seeing many new bug fixes or features. Still the project is moving forward. Regression testing over the last week revealed some complex problems the team worked to get corrected, apparently taking more effort than anyone expected. While it adds nothing new it is progress. Posted in Mesh, Second Life. Tagged Guild Hall. There is currently a shift in mesh development. To understand the shift you need to understand how viewer versions are made. You probably know programmers write a program that becomes the viewer. The nuance in that process is the language programmers write in is not the language computers speak. So, at some point a translation has to happen. That ‘translation’ is called a compile. The compiler tool being targeted for use is Microsoft’s Visual Studio 2010. Much of the last week’s work and probably this week’s and next week’s will be toward getting the new mesh-viewer code compiling using VS2010. What you may not realize is why the change to VS2010 is important for the Mesh Project. The main SL Viewer has been worked over to get it to compile in VS2010. See: Second Life 2.6.3-225584 VS2010 Review This moves the code and the viewer abilities to a new level of optimization for newer computer hardware. If you follow KirstenLee’s viewer development, you know it too has moved to VS2010. So, most viewers on the SL grid are going to be optimized to a 2010 era, at least for those on Windows systems.